Wordless Wednesday – Raining Cats and Dogs! This entry was posted in Uncategorized and tagged Cornus, Garrya, Hazel, Wordless Wednesday on January 28, 2015 by thelonggardenpath. 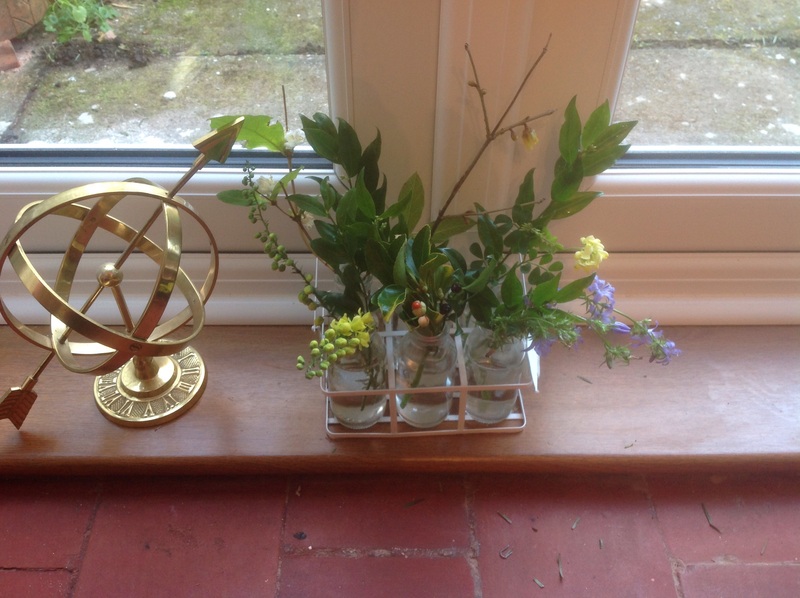 January – the doorway to the year. Named after Janus, the God of beginnings and transitions. Derived from tha Latin word ianua, meaning door. How apt, therefore, is my cuttings display at the moment, displayed by our new French doors! 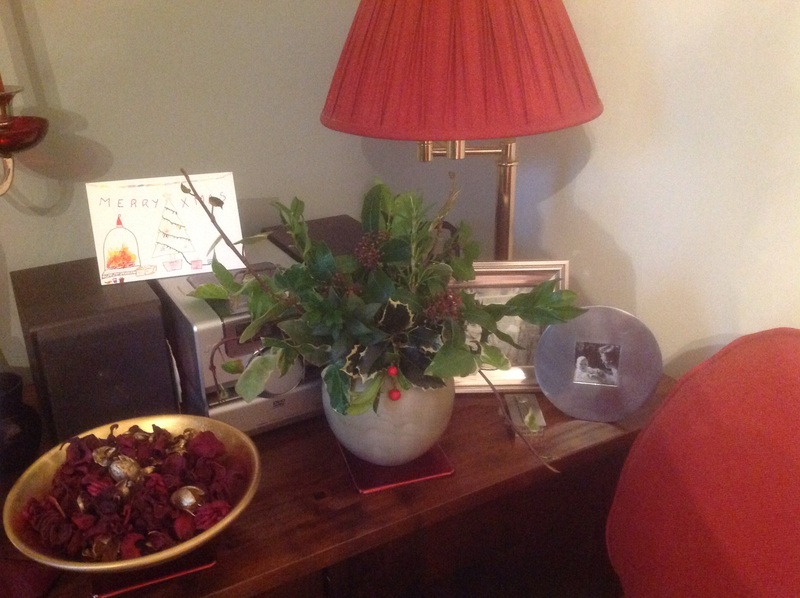 They are showing a selection of scented blooms, flowering at the moment against a backdrop of the evergreen Sarcococca, or Christmas Box. 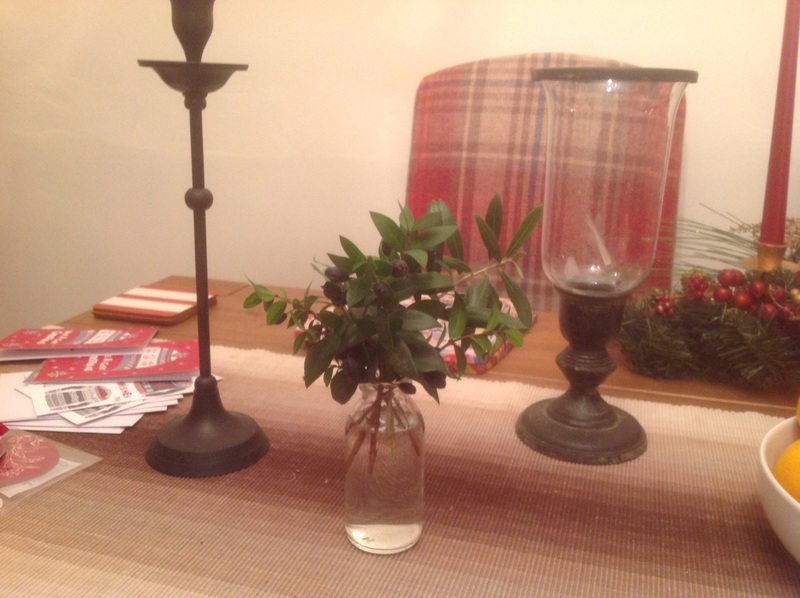 It’s looking forward to the garden delights to come, while coming full circle from this time last year, when I started my Cuttings Calender, using Sarcococca in my new little milk bottles. Oh, yes, I’ve done it! Completed a whole year of having flowers and cut material from our garden, on display in the house. Sometimes, rather minimal, and sometimes, I must confess, slightly past their best, while I get a chance to do a fresh vase, but there’s been at least one vase on the go all year. Now, to keep it up and get better! This has affected what I plan to grow from now on. I’m considering more bulbs and growing flowers for cutting. As I’m now struggling for border space for these plans, I’m searching for some quirky containers in which to grow them. And, I’ve been blogging now for a year, too. As many of you know, I was honoured to be nominated for a Liebster award too, to coincide with my anniversary. January is also the time of returning to “normal”. I trust you all had a pleasant festive season. For the last couple of months, my garden has had to take a bit of a back seat, with, not only Christmas preps, but also the dreaded D.I.Y. to deal with! At least it’s been a quiet(ish)time, gardening wise. I’ve still been enjoying my walks around the “Estate”, seeing what is developing, and taken some interesting snapshots along the way, but with no coherent storyline – somewhat random – but I’ll show them anyway! 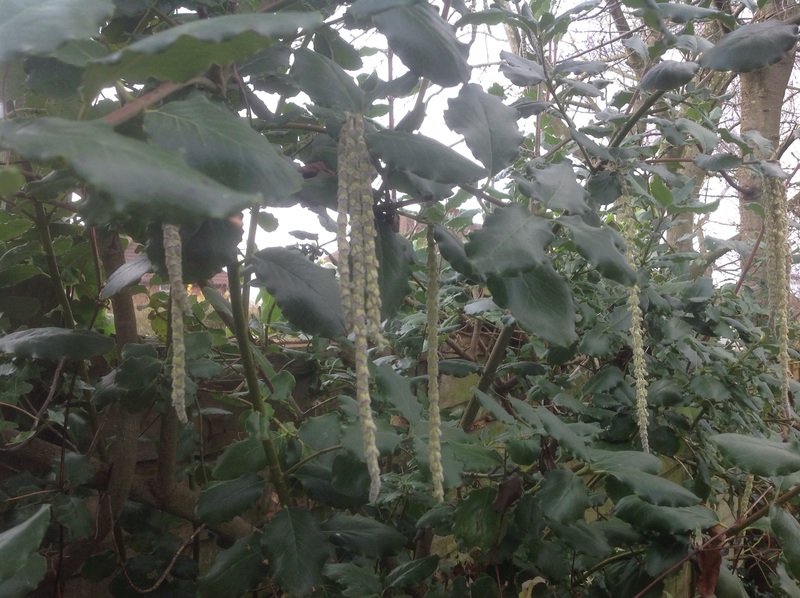 They mainly revolve around the weather effects in the garden – or to be more precise, frost. It has been such a mild Christmas period, with temperatures well into double figures at times, but contrasting with some cold snaps giving us some pure white frosty scenes, and even a touch of snow, albeit short lived. I have some shots of our frosty garden. Note the garden fork staring at me, reproachfully! Glass of wine, anyone? Hot chocolate, more like! And there were some magical frost effects! One of my somewhat overlooked shrubs, given as an unknown cutting, (unknown other than it’s an evergreen Euonymus) and just plonked somewhere to grow away, threw up a surprise. The most amazing berries – totally unexpected! I knew deciduous Euonymus developed similar interesting berries, but not the evergreens. I’m always learning! 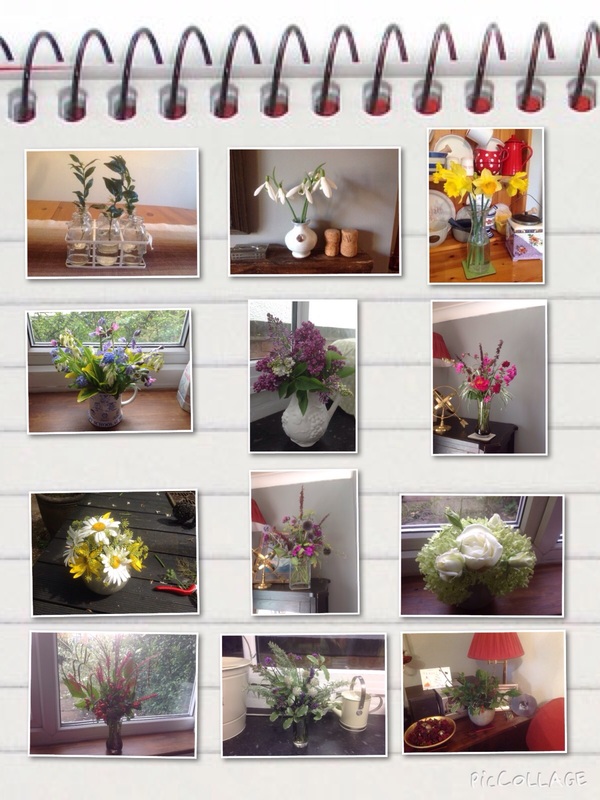 It has grown in my estimation over the last year for providing good foliage for vases. And now, berries too! Some were immediately added to the milk bottles! It will be a bit more valued from now on. 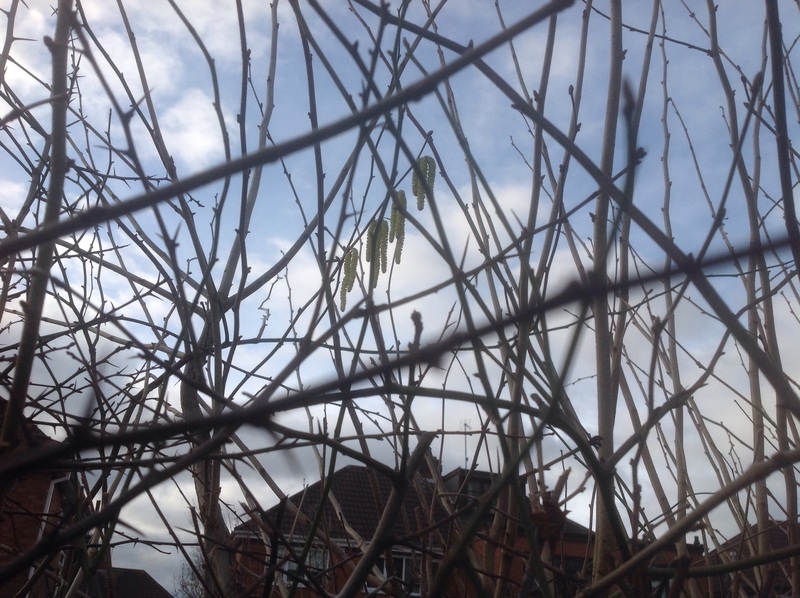 And on one glorious winter day…. …. what a racket greeted me! The sycamore trees at the end of the garden, silhouetted against a beautiful blue sky, was full of birds chattering away. They were too far away to make out what they were, but I suspect they may have been starlings. If so, we don’t normally see them in our garden. Slim and dark and not too large. Am I right in thinking that starlings tend to flock and are renowned for their song? Anyway, it was such a cheerful experience! And now it’s time to look forward. 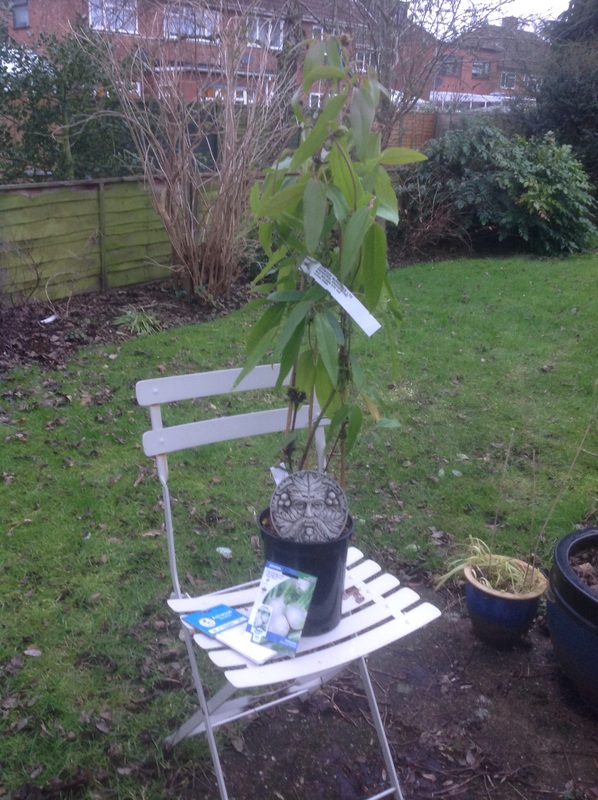 Have any of you got any gardening New Years Resolutions? What plans have you got for your gardens this year? Here’s to another gardening year! I can’t wait to get started! 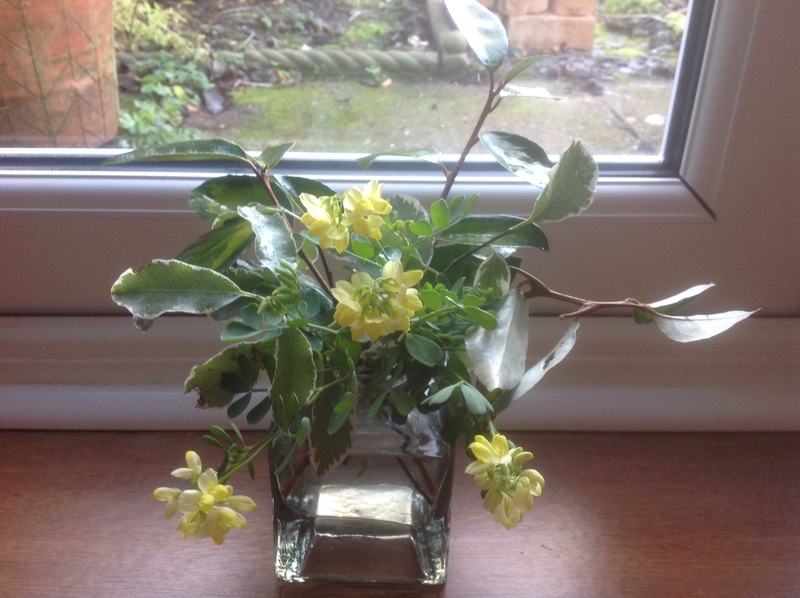 This entry was posted in Uncategorized and tagged Birdsong, Cuttings, Euonymus, Frost, Garden scent, Milk bottles on January 11, 2015 by thelonggardenpath. 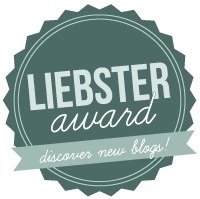 How pleasantly surprised I was when Chloris at “The Blooming Garden” nominated me for the Liebster award. What is it? Well, Chloris describes it as a sort of chain letter, with the aim of recognising new blogs, and bloggers that you have enjoyed reading. Put that way, it’s very much an honour, and very rewarding to realise that people are enjoying what you write. So thank you, Chloris! When you accept this, you have to link back to the person who nominated you, and then you have to answer their set of eleven questions. Then you pass it all on by nominating five other bloggers of under 1000 followers. Do inform them and explain the rules. If they accept, you have to set them all another set of eleven questions. And so on! So I’ll start with the questions that Chloris set me. 2. Which is your favourite gardening book? The one I’m reading at the time! No? O.K.,tricky one. My RHS encyclopaedias are constantly being referred to, as are my Dr. Hessayon books, but if I must pick one, it would be the first gardening book I bought, that helped me plan my new garden and introduce me to my love of scented plants. “The Garden Book” by John Brookes. 3. What do you love to do when you are not gardening? Oh, dear! Sorry, Chloris! Please don’t banish me to Room 101 or retract my award! My other great pleasure is watching Rugby Union, and our local team. There, I said it! It has to be “Breakfast at Tiffany’s”, with the wonderful Audrey Hepburn. Roses – the ultimate scented flower! 8. 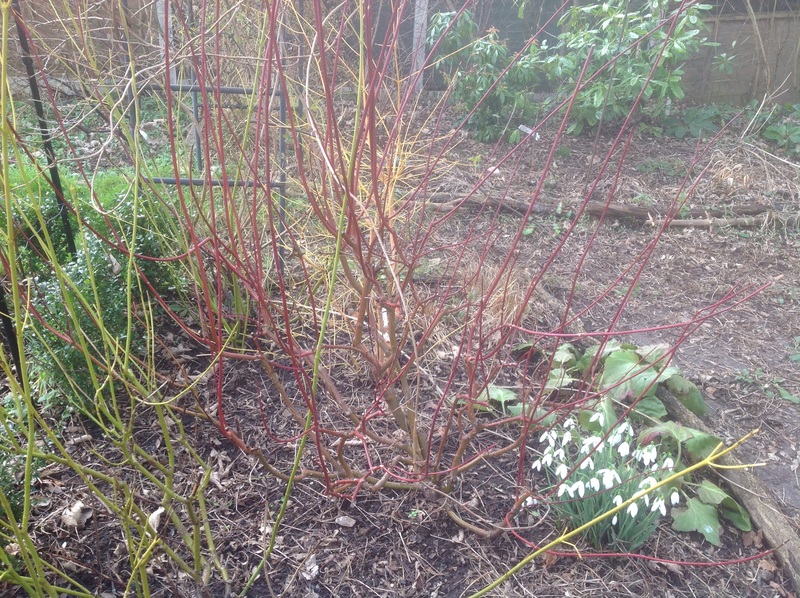 How long have you been gardening and what got you started? I’ve been gardening for 23 years, since I was first confronted with our first and current garden of 160 ft long. What do I do with it? Thank you, John Brookes! 9. Do you garden organically? Yes! Or at least wherever I can. Weeds that I can’t remove by hand, hoe or fork, is where I occasionally lapse. 10. How do you deal with slugs and snails? A 3-pronged attack. Organic slug pellets, avoiding slug “dinners” (I no longer grow their favourite food stuffs such as delphiniums and lupins) and standing on them! And I’m beginning to wonder if copper bands round pots may, actually, work! 11. Do you prefer cats or dogs? Cats, although I’m allergic to both. Now for the hard part – my nominations. That is so hard. I love reading all the blogs I follow and enjoy them immensely. But I must choose! I do hope my nominees will accept. If they do, they must pass on the baton, by nominating 5 others. And I hope they enjoy my questions. 2. What is your favourite colour in the garden? 3. What is your most loathsome pest? 4. What is your favourite national style of cuisine? 5. Gardening gloves or bare hands? 6. What is your highlight of 2014? 7. And have you any gardening New Year’s resolutions? 8. What would be your “Desert Island” disc? 9. What is your most and least favourite gardening task? 10. What was your favourite subject at school? 11. What is your favourite garden that you have visited, and why? This entry was posted in Uncategorized and tagged Blog award, Liebster award on January 2, 2015 by thelonggardenpath.